Those of you who have been patiently putting up with the shortcomings of document editing on your iPads and Nexus tablets while you wait for Microsoft to release a mobile version of Microsoft Office®, will be sorely disappointed by the recent declarations of Steve Balmer and Kurt DelBene, the head of Microsoft’s Office division. In short, you can forget about Microsoft Office on anything other than a Windows Phone or Windows 8 tablet. The same goes for the confusingly branded Skydrive Pro, which was announced by Microsoft in 2012 as being the new mobile offline client for Microsoft SharePoint. If you have not been keeping up to speed with what is becoming something of a saga, Microsoft and Apple are in the middle of a major dispute over the payment of royalty fees to Apple for upgrades or paid subscriptions within in apps that have been downloaded from the IOS App Store for free. Essentially, Apple is saying that if a developer charges for an app or service relating to an app that was free at the time of download, they want their 30% royalty fee. This is something that Microsoft has found hard to stomach and so they have (for the foreseeable future) decided to eschew the IOS platform. [The lack of availability of Microsoft Apps on Google Play is due to other reasons]. 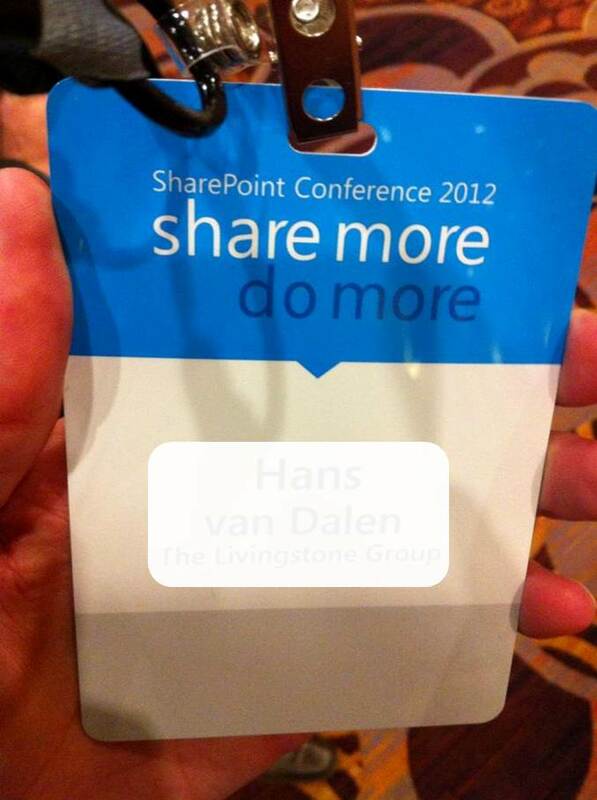 Microsoft’s mobile SharePoint plans up in the air? Fear not however, because companies like Azurati have developed solutions that provide cross-platform mobile SharePoint with on and offline working options and the ability to use full Microsoft Office to edit documents, spreadsheets or presentations live on any mobile device. Azurati has integrated Microsoft Office Web Apps® into its HTML5 SharePoint2Go® solution, allowing documents stored in Microsoft SharePoint to be edited live and saved back to SharePoint without having to download documents to third party editing applications and then having to upload them back to SharePoint (sometimes with document formatting issues) at a later time. Its a really neat solution and gives users what they want: to be able to edit documents in Microsoft Office. Are you considering deploying mobile versions of your enterprise applications, like Microsoft SharePoint or other line of business applications, to your users? Gartner estimates that by the end of 2014, 70% of companies will have deployed an enterprise mobile or BYOD strategy. 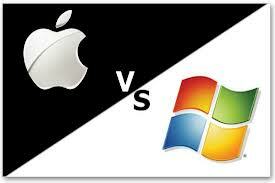 Azurati is a leader in providing secure, cross-platform enterprise mobile applications. Join this webinar to learn more about how we can help you to deliver on your enterprise mobility strategy. This webinar will appeal to IT professionals, business executives and systems integrators who are looking at deploying secure cross-platform mobile applications to enterprise users. 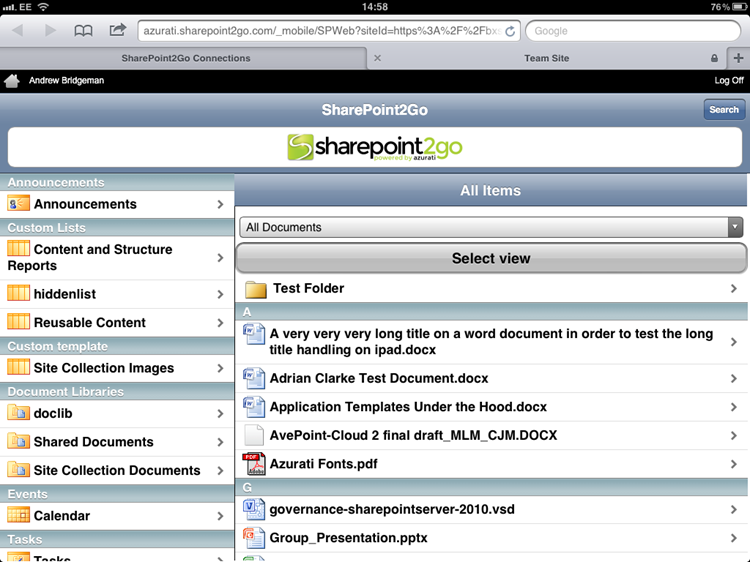 Video demonstration of Azurati SharePoint2Go, a secure HTML5 cross-platform mobile SharePoint solution. Contact Azurati via http://www.azurati.com for more information about how you can deploy mobile SharePoint as part of your enterprise mobile or BYOD strategy. Nielson Norman Group, a leading Intranet design and consulting firm, have just published their annual top 10 Intranets study; an annual review of the top 10 corporate intranet sites from companies around the world. Interesting points to note from the report are that, according to Nielsen Norman, over 70% of corporate intranets are built on a Microsoft SharePoint platform, and mainly due to the fact that corporate intranets take a very long time to develop and perfect (an average of 26.5 months or 2.3 years), mobile enablement of corporate intranets is seriously lagging behind other new features, like Social Collaboration. This means that many corporate intranets are failing to address the needs of a growing number of users who want to be able to access corporate information and knowledge on mobile devices. Gartner estimates that by the end of 2014, 70% of enterprises will have implemented a BYOD strategy and the corporate intranet is one of the most obvious enterprise resources that should be made available on mobile devices. As with all things software, there will always be the debate as to whether one should build and develop a bespoke solution, or whether a commercial off-the-shelf solution would make better commercial sense. The same will undoubtedly be the same when you come around to considering mobile-enabling your SharePoint-based intranet. 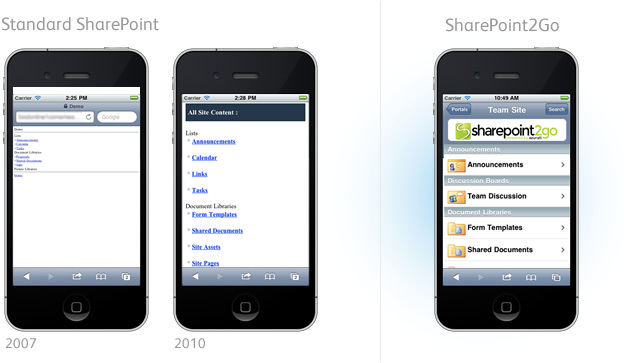 Our (biased) counsel, would be to refrain from custom development of mobile interfaces with SharePoint. It is a fairly well known issue that Microsoft has not done a good job with the standard mobile templates that ship with SharePoint. Even with SharePoint 2013, developers are dissuaded from branding and customising the standard mobile templates that ship with SharePoint. In addition, new mobile templates need to be developed for each form-factor that is released, which can lead to prohibitive on-going costs of maintenance and support. That is why solutions like Azurati’s SharePoint2Go solution is able to deliver mobile enabled SharePoint that will work seamlessly on any mobile device in five minutes. Not only does SharePoint2Go deliver an instant cross-platform mobile solution for SharePoint intranets, it also includes over 15 options to authenticate your mobile users securely; with everything from forms-based authentication to 2-factor built in to SharePoint2Go’s administrator wizards. If your SharePoint intranet is heavily customised with value-adding functions that make your desktop version of your intranet a productive experience (like company news, people finders, document repositories, management dashboards, etc. ), SharePoint2Go can be extended by developers to create mobile versions of custom SharePoint web parts – we call them V-Parts. V-Parts can be designed to be used within the mobile SharePoint interface, or as stand-alone full-screen mobile applications that can operate in offline mode as well as online. As an HTML5 mobile application that is accessible via the mobile device’s browser, SharePoint2Go will work with feature-parity on any mobile device, no matter what the market throws at you; making it the ideal solution to complement your enterprise mobile or BYOD strategy. will not require costly internal development teams to develop and maintain your mobile environment, or costly Mobile Device Management (MDM) solutions, get in touch with Azurati. To find out more about Azurati’s SharePoint2Go solution for mobile-enabling Microsoft SharePoint and to request a free 14 day trial, contact info@azurati.com or visit www.azurati.com. The development team at Azurati would even have impressed Santa’s Elves this Holiday season with the raft of new exciting innovations and enhancements that they have managed to roll-out to support our secure, cross-platform mobile enterprise proposition. The Azurati Mobile Portal provides a new way for enterprise users to access HTML5-based mobile applications securely from any mobile device. With the Azurati Mobile Portal, enterprise users are able to authenticate themselves once and then use the Mobile Portal interface as an HTML5 mobile application launchpad, enabling mobile apps to be launched with secure single sign-on. The Azurati Mobile Portal is great for both IT and the mobile user community because it provides a secure environment to access HTML5 mobile applications that can be centrally controlled (without needing expensive Mobile Device Management solutions). HTML5 mobile applications are published to the Azurati Mobile Portal via the Azurati ASAP mobile application platform. Azurati Apps are HTML5 applications that can be developed as cross-platform mobile applications from the ground-up, or as cross-platform mobile versions of existing enterprise software applications. What’s more, for the first time, Microsoft SharePoint users who frequently access custom developed Web Parts in SharePoint, can create specific full-screen mobile applications from Web Parts that can be accessed via the Azurati Mobile Portal. Examples of these may be Staff Contact lists, Product data lists, Company news and discussions, etc. 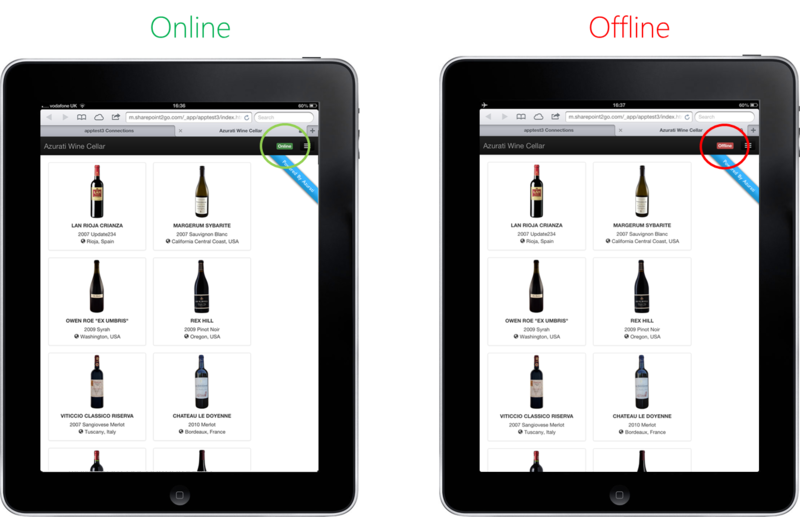 Azurati Apps can be developed to support Dynamic Offline access so that mobile users can continue to work and be productive even when Internet connectivity is lost. Azurati has made a number of enhancements to our V-Part architecture that now makes it easier than ever to convert custom developed SharePoint Web Parts and access them via Azurati’s cross-platform mobile SharePoint solution, SharePoint2Go. 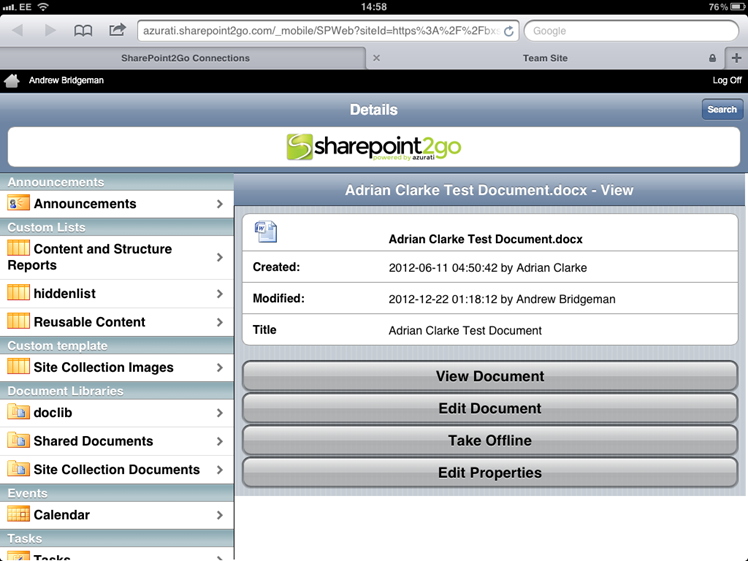 A common request from Azurati customers was the ability to edit documents from SharePoint2Go. 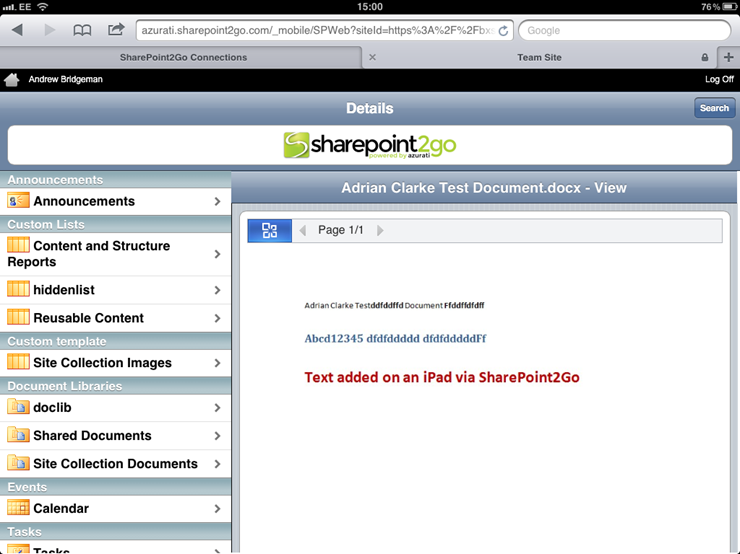 Up until now, this has been technically complex because of the fact that SharePoint2Go is a mobile web application. 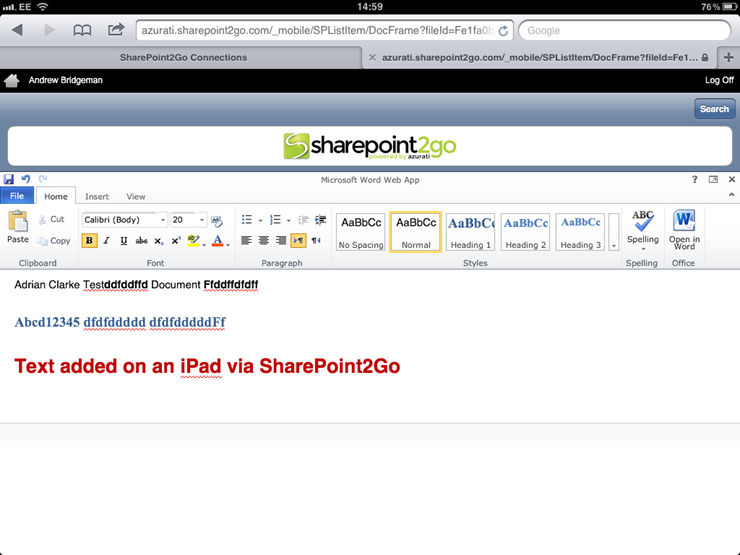 However, we are pleased to announce a new capability that will allow live editing of documents from SharePoint2Go using Microsoft Office Web Apps on iPads. We are pleased to announce also, that we are now able to offer On-Premise deployments of SharePoint2Go in addition to our standard Microsoft Azure Cloud option. Enterprise customers who feel that they are unable to make use of Cloud-based services may install the Azurati SharePoint2Go server on internal servers behind the corporate firewall. If you are considering HTML5-based mobile applications as part of your enterprise mobility strategy or if you would like to understand more about any of these announcements and Azurati’s HTML5 enterprise mobility solutions, please contact us via www.azurati.com. According to a recent poll by Azurati, access to mobile SharePoint is seen to be one of the most critical must-have mobile enterprise applications for organisations who are looking to deploy enterprise applications to mobile users as part of a BYOD or COPE (Corporately Owned, Personally Enabled) mobile strategy. Social Collaboration, workflow approvals and BI dashboards also scored highly amongst those who responded. Enabling mobile users to authenticate across the corporate firewall to access internal applications, like SharePoint, is often the single biggest challenge that IT teams will face. Azurati makes authentication and secure access easy, because we have done all of the hard work for you and provide 15 options for enterprise customers to set up secure authentication to their SharePoint environment in a simple Wizard interface. Azurati also supports multiple methods of authentication, allowing options like federated profiles (so users can use their standard Active Directory credentials, or they can log on using external authentication providers, like their Window Live ID, Google or Yahoo accounts. This option is often useful if you are thinking about providing mobile SharePoint access to external stakeholders or temporary staff). Azurati’s SharePoint2Go solution guarantees to support any smartphone or tablet on the market, including devices like Windows Surface RT tablets, Amazon Kindle Fire tablets and the upcoming Blackberry 10 range of devices, as well as standard mobile platforms like IOS, Android, Blackberry and Windows Phone devices; making Azurati your ideal BYOD partner. You can customise the standard mobile templates that ship with Microsoft SharePoint, but they require extensive specialist developers to create specific templates for target mobile platforms and form factors, which will need to be updated as new devices emerge on the market. Microsoft’s latest guidelines are for SharePoint developers to not customise the SharePoint interface. For those companies that have invested significant time and money in their corporate identity and brand and who wish to extend that identity to mobile SharePoint users, Azurati’s SharePoint2Go solution will allow full branding and UI customisation to truly make your mobile SharePoint yours. It is rare these days to find a SharePoint implementation that does not include some elements of custom developed components, or WebParts. WebParts often make SharePoint come to life as a corporate Intranet platform or ECM platform by providing views and access to functionality like Staff contact lists, company news and events, weather, advanced search, recently edited documents, BI/Management reports and dashboard, Sales pipeline data, etc. You should ask a simple question: if your users make use of custom developed WebParts in the desktop version of SharePoint, should all or some of those WebParts be made available to mobile users? There is of course one major challenge here. All mobile SharePoint solutions on the market (including the native mobile option from Microsoft), with the exception of Azurati, can only display standard SharePoint features (like documents, news, list data, calendars, tasks, etc) to mobile users. Azurati allows custom developed WebParts to be transformed in to mobile WebParts, or V-Parts®, as Azurati calls them. 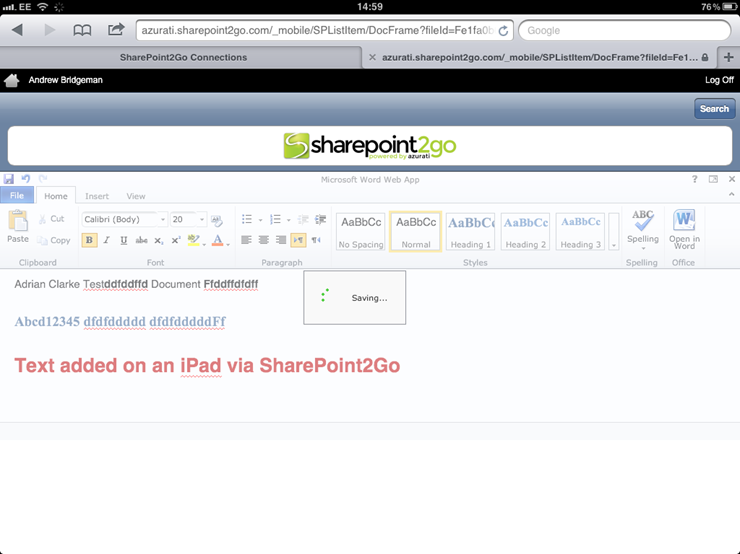 V-Parts can allow custom WebParts to be used interactively within the SharePoint2Go solution on any mobile device. V-Parts can also be developed to operate in dynamic offline mode, so you can continue working even if you do not have internet connectivity. If you are thinking about deploying mobile SharePoint, this is a great opportunity for you to do so at a great discount. For more information about Azurati and SharePoint2Go, the secure cross-platform mobile SharePoint solution, please visit www.azurati.com and request a free 14 day trial. Azurati announces a strategic partnership with Navantis Inc., a Canadian IT leader and 2012 Microsoft Global Partner of the Year (Canada). Navantis will be offering Azurati’s SharePoint2Go® and enterprise mobile application platform to customers in Canada and North America. The partnership will focus on offering customers SharePoint2Go®, a cloud-based service that represents a breakthrough in making Microsoft SharePoint simple, secure and accessible on any smartphone or tablet, while helping businesses address the exponential growth of bring-your-own-device (BYOD). Gartner has predicted that by 2014 “90% of organizations will support corporate applications on personal devices”. Earlier this year, the Navantis Expert Series provided thought leadership around this trend when it hosted a series of BYOD events across Canada. The theme of the series was to educate IT and business professionals on the challenges raised by BYOD and to provide real solutions that are working today. 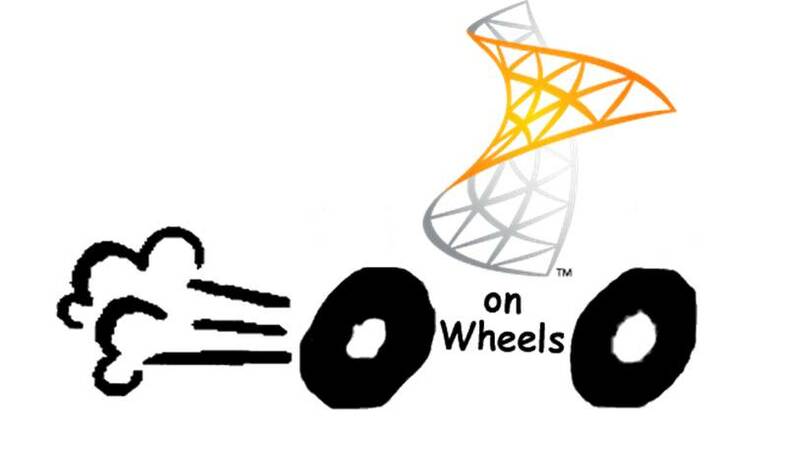 One of those solutions now includes SharePoint2Go®. Built on the Microsoft Azure cloud platform, SharePoint2Go® is designed to specifically address the concerns that organizations operating Microsoft SharePoint will face with respect to BYOD. Mobile security features are the heart of the SharePoint2Go® solution, making it one of the most secure mobile SharePoint solutions on the market today, providing a range of features unmatched by its rivals. Designed from the ground-up to offer a secure mobile deployment, SharePoint2Go combines ease-of-use, simple user interface and single sign-on, coupled with strong security features. The Navantis strategy of selecting best-of-breed technology partners to deliver outstanding results to their client community has resulted in significant industry recognition in the past twelve months. This included being named as a winner or finalist for technology collaboration with best-of-breed partners at both the CDN Elite Awards as well as the Microsoft Canada IMPACT Awards for work at Direct Energy, Canadian Breast Cancer Foundation and PHO. Providing education, roadmaps and proven solutions for corporate IT enabling any computing device, smartphone or tablet access to the business without the worries of IT setup, support and security is a priority for both Navantis and Azurati. This partnership combines Navantis’ experience and successful track-record with Azurati’s innovative SharePoint2Go® offering. Developing today’s most advanced IT solutions takes great partnerships with thought-leaders who share the same vision of empowering clients to exceed their goals.